= Copiapoa coquimbana var. alticostata (F.Ritter) A.E.Hoffm. Cact. Fl. Silvestre Chile 108. 1989 A.E.Hoffm. Origin and Habitat: Atacama/Coquimbo - Huasco to southern of Fray Jorge inland in the valleys of Elqui and Choros, Chile. It is possible to find an interesting colony in Freirina. Altitude: 200-1200 metres above sea level. Habitat: It grows on gentle slopes and almost flat areas on rocky soil along with scattered shrubs up to 1,5 m tall and other cacti such as Eriosyce napina, Eriosyce napina ssp. lembckei, Eriosyce crispa, Eriosyce villosa and Eulychnia breviflora. Copiapoa coquimbana var. alticostata (F.Ritter) A.E.Hoffm. Copiapoa coquimbana var. pendulina (F.Ritter) A.E.Hoffm. Copiapoa coquimbana var. pseudocoquimbana (F.Ritter) A.E.Hoffm. Copiapoa coquimbana vallenarensis (F.Ritter) A.E.Hoffm. Copiapoa wagenknechtii F.Ritter ex Backeb. Copiapoa pepiniana (Lem. ex Salm-Dyck) Backeb. Copiapoa pseudocoquimbana f. variegata hort. Description: Copiapoa alticostata (= Copiapoa coquimbana var. alticostata), which is now subsumed in Coquimbana coquimhana, is considered by many authors a natural hybrid between Copiapoa echinoides var. dura and Copiapoa coquimbana. 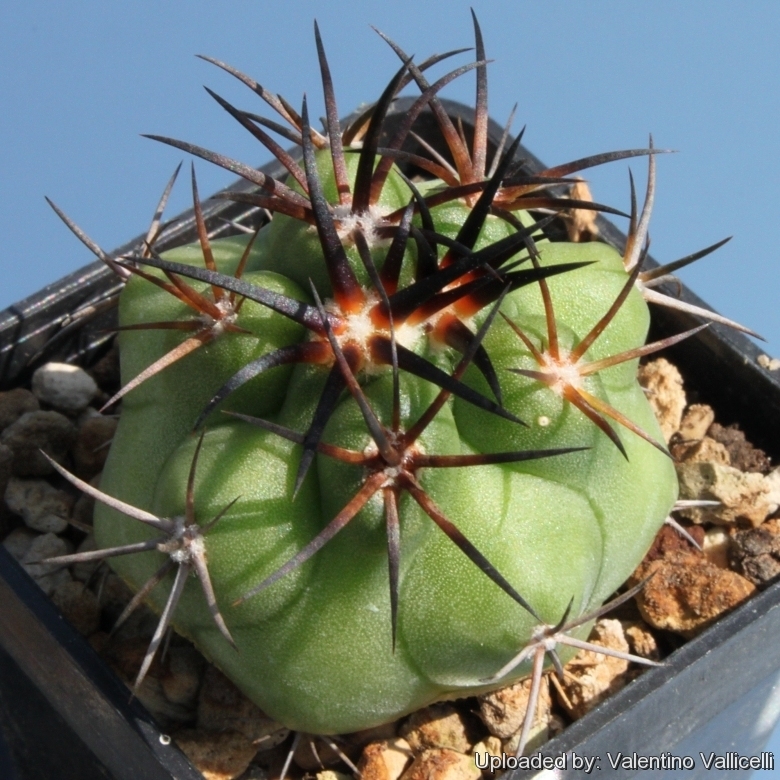 It is part of the very variable Copiapoa coquimbana complex, but distinguishes from other forms for its tall ribs and very strong, dark brown to black spines, it would be a good idea to retain the old name as well. It varies considerably in cultivation from native habitat. In habitat, the bodies are much compact and very spiny. When grown in pots, this species tends to elongate and have darker spines on most of the body, with grey-white spines only appearing on the oldest areoles at the bottom of the plant. Habit: It grows in clusters and may form splendid mounded clumps with time. Stem: Young stems spherical green, later elongated 20-40 cm tall grey-green or dark silver, and crowned by a dense mass of white wool, particularly at flowering time. Apex in mature specimens up to 5 cm in diameter, often spineless and depressed. Ribs: It has high ribs about 12 to 18 mm tall, visibly separated and strongly tuberculate especially in young specimens. Areoles: Large, broad, almost round about 8-13 mm Ø. Young areoles filled with soft dull white felted wool quickly ageing to almost dark grey and often sunken into the ribs. Spines: Strong, stoutly subulate, rigid, at first dark brown to black, afterwards becoming greyish. Radial spines: Stout, fairly slender, evenly spreading outwards, more or less standing out in a radiating manner, slightly curved inward, with a wide lateral spine angle, round in cross-section. Central spines: 1 to 4, thicker, upward pointing, round in cross-section. Flowers: 1 to 3 at a time, diurnal closing at night, protracting the period of opening many days, funnel-shaped, yellow-pink. Fruit: Round to elongate green. Copiapoa coquimbana var. alticostata (F.Ritter) A.E.Hoffm. : has very strong, dark brown to black spines. Distributiom: between Freirina and Huasco. Copiapoa coquimbana subs. andina I.Schaub & Keim: has outstanding golden-yellow spines. This golden appearance is not typical of any other Copiapoa. Distribution: North east of Vallenar. Copiapoa coquimbana var. imbricata Kníže: has strong, chocolate-brown to almost black young spines. El Molle and adjacent areas, Rio Elavi. Copiapoa coquimbana var. pendulina (F.Ritter) A.E.Hoffm. : It is similar to C. pseudocoquimbana but with slightly stronger spines. Distribution: Coquimbo to Valparaiso. Copiapoa coquimbana vallenarensis (F.Ritter) A.E.Hoffm. : has few but steonger radial spines. Diatribution: Huasco and Vallenar Valley. Copiapoa militaris Kníže: has stronger spines than the type. Distribution: Chanaralillo. Copiapoa pseudocoquimbana var. domeykoensis F.Ritter: is a giant form of C. coquimbana that is found on the far North part of the habitat of this species. Distribution: South-west of Domeyko. Copiapoa pseudocoquimbana var. vulgata F.Ritter: has very long mostly stighter spines. Distribution: Coquimbo to Frai Jorge. Copiapoa schulziana I.Schaub & Keim: mainly one-headed, non caespitose plants with much bigger head size, occasionally reaching heights of 50 cm as unbranched plants and up to 23 mm in diameter. Distribution: West of Domeyko, III region, Chile. 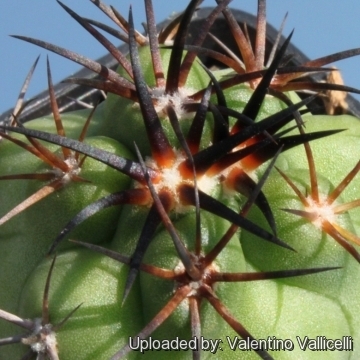 Cultivation and Propagation: Considering that Copiapoa coquimbana var. alticostata comes from a habitat with an extremely arid climate, they are remarkably tolerant of pot culture. These plants have taproots and are susceptible to overwatering. They requires also an appropriate air circulation. Copiapoas are summer grower species easy to cultivate. Growth rate: This is a slow growing cactus kept for the beauty of its form that will make clumps given the best conditions. Soils: It likes very coarse mineral cactus mix soil, but can become too elongated if compost is too rich. Watering: It requires light but regular waterings in summer, but let the soil mix dry between waterings, but do not overwater (Rot prone), it must be strictly kept dry throughout the winter quiescent period since it is very sensitive to any moisture excesses keep dry in winter. Hardiness: Not highly tolerant of a great deal of frost. They need to be kept in a cool place during winter rest and are resistant to light frost if kept on the dry side prior to, and during, cold weather ( they are hardy to -2 C ° C short periods). However some warmth throughout the year will increase the grower's success (minimum 5° to 10°C during rest season). Exposition: Requires full sun or light shade and careful watering to keep plant compact with strong coloured spines. Tends to bronze in strong light, which encourages flowering and heavy spine production. Light shadow my be useful in the hottest summer days. - Scales: Scales are rarely a problem. It is wise to treat your whole collection with a systemic insecticide twice a year in spring and autumn. Propagation: Seeds (or offsets if available), Grafting is often used to speed growth rate and to create a back-up to plants in collection. Seeds germinate in 7-14 days at 21-27° C in spring, remove gradually the glass cover as soon the plants will be well rooted (ca 1-2 weeks) and keep ventilated, no full sun for young plants!